The summer heat has arrived in most places and that usually means less clothing so we can all stay cool. But not every woman likes wearing sleeveless tops. So how does one dress to stay cool? Here are five summer outfits that cover your arms, are stylish and will keep you cool. We all have areas of our bodies that aren’t exactly our favorites. Some women don’t like shorts, while others opt for bathing suit alternatives. When it comes to summer outfits that cover your arms but still help you stay cool, I’ve featured three different styles that are my favorite. They’re my favorite because they are stylish, lightweight and the perfect alternatives to sleeveless tops. 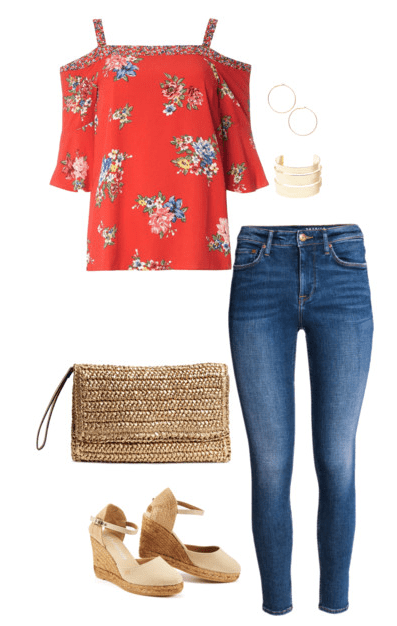 The tops are: cold shoulder, boho, and chambray. Now I know cold shoulder tops are not for everyone. One time a Facebook friend of mine went on quite the rant about these ‘ridiculous’ tops and how they make no sense. Each to their own, right? Not only do they make sense to me, I love them! I still have the benefit of what sleeveless tops offer (air flow) but they cover the bottom of my arms, an area a lot of women don’t care for. If you’ve never tried this style, I highly recommend heading to your favorite store and at least trying them on. You might walk out with one and you might not! But I’ve seen women of all ages wear these and they look fantastic. 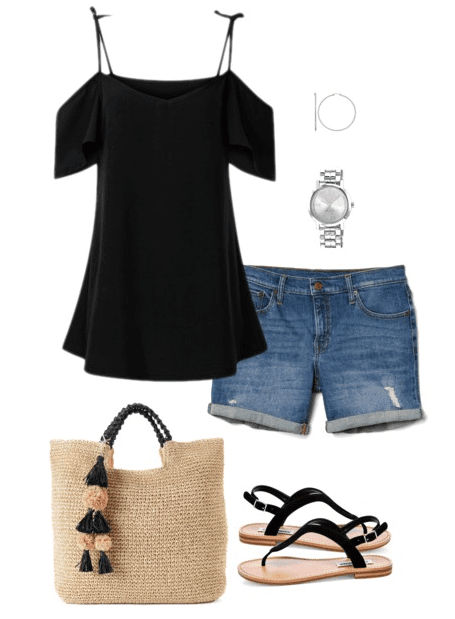 Here are two summer outfit ideas featuring the cold shoulder top. The wedge sandals I linked to above, I own and am so pleased with them. They don’t come in half sizes, so I was a little worried when I ordered size 8, even though I wear 8 1/2, but they fit great. I wore them to a wedding recently and was in them for hours. They look really good with jeans, shorts, dresses, and skirts. Such a versatile shoe! This style of top is perfect for summer because it’s flowy and allows some breeze to slip through. (Unlike a lot of cotton t-shirts.) When it comes to boho tops for the summer, I look for ones with 3/4 sleeves and save the long sleeve style for fall. I really like the mustard top and white denim combo. In my summer trends for 2017 post, I shared how yellow is a big trend. It took me awhile to fully embrace this color, but after I did, it became a favorite. When it comes to white denim, I know it’s not for everyone. If you have babies and toddlers, your white jeans will surely see a stain before breakfast is even served. Now that my kids are older and out of that stage, I regularly wear white denim and yes, there are days they see a stain. I keep saying I’m going to purchase a pair of Old Navy’s Stay White Jeans that repel stains, but I haven’t yet. A few of my friends rave about them though. If you’re needing outfit ideas for your white jeans, or are wanting to purchase some, check out my post on how to wear white jeans in the summer. The white boho top pictured above is so pretty! It’s called the Circle of Love Top and features crochet lace. I decided to pair it up with a skirt for a different style of outfit, but this top would equally look perfect with jeans or shorts. Believe it or not, a chambray top is great for summer. As long as you pick the right one! Choose one that has tabbed sleeves or ones you can roll up easy. You also want it to be very lightweight. I really like how this chambray shirt looks with the orange shorts and striped tote. The shorts are from prAna, a brand I have come to love. The shirt is from J. Crew and most likely by the time this post publishes, it’ll be sold out. If it is, here are a couple of alternatives: Classic Chambray Shirt and Cotton Chambray Top. Previous articleEnter the $250 Nordstrom Gift Card Giveaway!